GORGEOUS RESORT ON MEDANO BEACH (swimmable), VIEW OF ARCH. June Discounts! Villa La Estancia is the best resort on the beautiful swimmable Medano beach. La Estancia is privately owned and it has the luxury and service of a five-star resort with a world class spa, several restaurants and other great amenities on site. The unit is number 1306 and it is 2200 sf of living space on the 3rd floor with a great view of Land's End and the Sea of Cortez. The resort is on the beach and loaded with amenities (pools, fitness center, shopping, etc). We provide a great list of places to eat so you won't make mistakes when selecting a restaurant on your Cabo vacation. Our calendar is always up to date and please check out our reviews and you'll see what renters have said about their experience renting with us. The resort is directly on Medano Beach which is wonderful for swimming, sunning, viewing sunrises and sunsets and enjoying the majestic view of Land's End. There are many other activities such as parasailing, snorkeling, jet skiing, or just enjoying a good book while sipping on your afternoon cocktail. (yes, there is food and drink service on the beach or in the pool at the swim up bar) There are two gorgeous pools and five hot tubs on the site. You can start your day with a workout at the executive fitness center which has a Jacuzzi, steam bath, or sauna. You might just want to hang out at the pool's swim up bar and let yourself be pampered by the expert service personnel. There is golf, world-class sport fishing, kayaking, desert tours, local art shopping. Take a day trip to some of the fascinating towns of southern Baja California, or you can simply walk or take a short bus or taxi ride into Cabo San Lucas itself. Shop for Mexican silver, jewelry, metalwork, and pottery, then enjoy your dinner at one of the town's excellent restaurants. Upon booking, a comprehensive guide with tips from where to eat and activities will be provided. Many of our guests have told us how helpful this information was to maximizing their stay in Cabo. The condo is spacious with 2200 square feet of luxury living space. It is a complete luxury residence, with marble floors, granite countertops and beautiful tile work throughout. You will spend a good deal of time on the large terrace which looks out at Land's End, the very tip of the Baja peninsula. The terrace has ceiling fans, table and chairs and numerous lounge chairs along with a brand new gas grill. The condo has a full kitchen and dining room, breakfast bar, and living room. The master bedroom has a king-size bed and a sitting area, and the master bath has Jacuzzi tub, shower, and double sinks. The second bedroom has a bathroom and two queen-size beds. The living room has a pull out sofa bed and there is a third full bathroom with shower adjoining this living room allowing everyone to have their own full bathroom. There are cable flat screen TVs and ceiling fans in every room, as well as a DVD and stereo in the living room, and DVD player in the master bedroom. Private WIFI installed for exclusive use by guests of villa 1306 as well as FREE resort WIFI at the pool. This condominium complex is operated like a five star resort with expert and courteous concierge staff. They will take care of all the details that you want to get away from on vacation, from check-in to check-out. They will arrange transportation, restaurant reservations, and give expert advice on the activities in the area. There is onsite grocery if you need to pick up groceries. Also available there are pharmacy items, jewelry and clothing, movie rentals, and even a delicatessen. If you just want to stay on the resort, there are 7 restaurants on site or nearby. Room service is available as well. La Casona restaurant on property is wonderful. 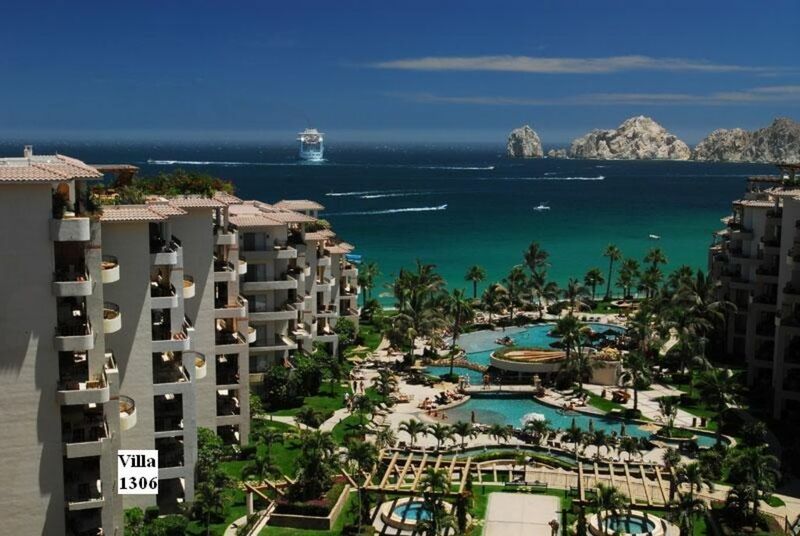 If you come to Cabo stay at the best location on the best beach and you will have an unforgettable experience. From relaxing to enjoying many recreational activities, Villa La Estancia offers it all. Many guests return to La Estancia because it is simply the best resort on the best beach in Cabo. Arrivals and departures on Saturdays are preferred. Number of occupants, stays of less than a week and those that don't arrive and or depart on a Saturday are ok, just keep in mind, rates quoted may be higher based on the above mentioned. Discounted pricing may be available in off season so please inquire. Peak season and holiday rates may be slightly more. Please send an email with your requested dates for firm pricing. Credit Card service charges through VRBO will be billed to the renter at 3% and if its an international card there is an additional 2% charge. Villa La Estancia in Cabo San Lucas is a fantastic location for everyone. It has abundant nightlife and times to just relax on Medano beach or by one of the many pools. The dry desert climate alongside the Sea of Cortez makes it a great destination year round. The choices of activites are endless...whale watching, fishing, shopping, dining, enjoying the onsite 3 story spa, working out in the spacious gym and just people watching. A typical day might start with a short walk to the 'Office' beach restaurant for breakfast which is right on the Sea of Cortez followed by sitting on the beach watching all the activities or just reading a book. Afternoon cocktails delivered to your chair on the beach or swimming up to to bar in pool are a must on most days. A quick call to the concierge and your reservation for dinner is made. A short 5 minute cab ride to town to one of many fabulous restaurants and a laid back evening checking out the vibrant town of Cabo. Just enjoy each day, don't plan too much and take it all in. New high speed WIFI modem installed for exclusive use by guests of villa 1306. Stairs and elevator very close to our unit. 3 counter chairs at kitchen island. 6 seats at dining room table. Lots of green space throughout the resort. Full tile balcony with a great view of the water and land's end. Tons of world class courses near the resort. Wow , Really nice, There Villa was so clean, Furnished very nice! and had a beautiful view, Everyone was so informative , I loved having a grocery store right there, and we even rented a car for one day right on sight, we loved the pool and the beach, we would stay there again ,,, Thanks ! Thank you very much for taking the time to share how you experience was in our little piece of paradise. I am glad you enjoyed your stay and we look forward to having you back. Thank you for your visit. We are glad you enjoyed the resort. I wish you would have reached out to us about the smell. We would have had maintenance replace the filter. They are on site and respond extremely quickly. The condo was beautiful. Great view! Would be better if it had a few essentials like coffee filters, dish soap, and scrub brush for dishes. We had a wonderful stay and enjoyed the resort very much. Lance was a great host and gave us some stellar recommendations for local restaurants and things to do. The condo was much larger than we imagined and was perfect for our family of 6. It was very clean and had amazing views of the ocean. The staff at the resort couldn’t be more helpful and friendly. This is our new favourite place to stay in cabo! We plan on coming back! Thank you for the kind words. We are so glad you enjoyed the resort and our unit. You are welcome back any time. To keep it simple, this place was great. Perfect for family of 4 traveling with 2 teenagers. The Host was very helpful with providing tips for transportation and dining. The staff here were very friendly and resourceful. Highly recommend staying here. Our first time at a non all-inclusive resort but it worked out just fine with the grocery run on the way in. Will be back. Thank you for the positive comments regarding your stay with us. I am glad you and your family enjoyed your vacation. Please dont hesitate to reach out if you need anything in the future. We look forward to having you return. Good experience could have been great except the guest bedroom bedding had moldy smell from sheets probably from leaving in washer too long.. furniture was very nice and amenities very good. Like this side of condos because you get to enjoy the Morning with less sun ..
John’s explanation sheets on orientation and expectations were good . Would stay again if they would take care of moldy sheets.. Sorry to hear that the sheets were smelling. They were probably left in dryer too long and not completely dry. Per my email sent once I was notified, housekeeping would have resolved that immediately. Thanks for staying with us and the other positive comments. Hope to see you again! Payment in full is due before resort confirmation will be provided to guest. Credit Card service charges will be billed to the renter at 3% and if its an international card there is an additional 2%. Discounted pricing may be available in off season. Peak season, holidays and stays of less than a week may be more than posted rates. # of occupants may also impact rates. Please send an email with your requested dates for firm pricing. Minimum age of 25 for rental unless approved by owners prior to booking. Cancellation Policy: Reservations may be cancelled up to 60 days prior to the start of the rental.